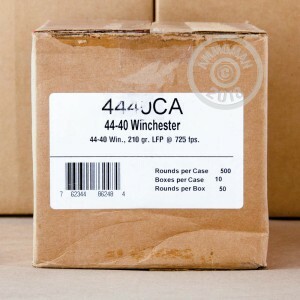 Stock up on this .44-40 for your next action shooting match! 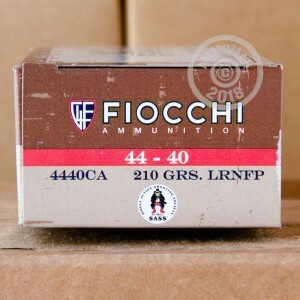 These cartridges from Fiocchi combine characteristics of classic cowboy ammo with modern conveniences that improve your experience without compromising authenticity. 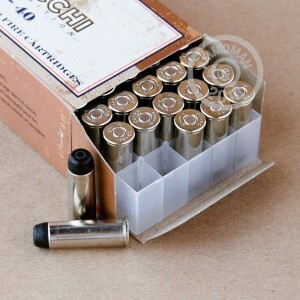 Each round in this box of 50 fires a heavy 210 grain lead round nose bullet at 725 feet per second; the soft bullet is ideal for hitting steel targets. The .44-40 was originally introduced for the Winchester Model 1873, but quickly found its way into the revolvers and rifles of other manufacturers' guns. Although used primarily for target shooting today, it has also served well in the hands of hunters and lawmen. These cartridges use modern non-corrosive Boxer primers--that's one area where we don't want to go back to the good ol' days! Stock up at AmmoMan.com and get free shipping on all orders over $99!